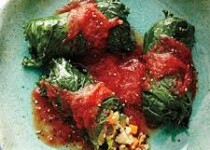 Hearty kale is a perfect wrapper for a vegetarian filling of quinoa and vegetables that's braised in a simple tomato broth. 1) Remove stems from kale and discard. Add kale to large pot of boiling salted water; cover and cook until leaves are softened, about 2 minutes. Chill in cold water; drain on paper towels. Set leaves aside. 2) In saucepan over medium, heat oil. Add onion, mushrooms, garlic and Garlicky Italian Seasoning; cook for 5 minutes or until onion is softened. Stir in quinoa or rice. Add broth; bring to a boil. Reduce heat, cover and simmer for about 15 minutes or until all liquid is absorbed. Stir in carrot, zucchini, salt and pepper. Let cool to room temperature. Stir in egg. 3) Preheat oven to 350F. To assemble rolls, spoon about 1/3 cup quinoa or rice mixture onto each kale leaf, just above where base of stem would have been. Fold bottom up over filling, tuck in sides and roll up. 4) Line 13x9-inch baking dish with half of the passata. 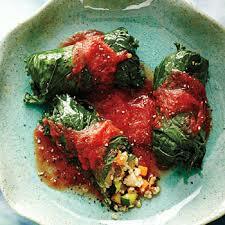 Arrange kale rolls on top; cover with remaining passata. Cover dish with foil; bakefor 1 hour or until tender.